On July 20th the Review to improve the transparency of the Therapeutic Goods Administration was published. From an evidence point of view the only game in town is the burgeoning market in what the TGA must only deem to be relatively low risk compounds, sold to a trusting public as alternative or complementary “medicines”. Under present regulations products do not have to demonstrate efficacy. They are thus registered only on a risk basis. Evidence need not be supplied proving claims advertised on packaging. Only an assurance that evidence exists. All that brain developing, flu resisting, sexual performing, “wellbeing” heightening hokudus pokudus has the credibility of a greeting card slogan. So, how does this happen? 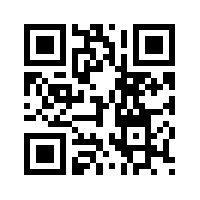 To register a product, sponsors use an electronic listing facility – ELF – by simply going online. Much like filling out a Facebook profile. Ingredients are selected from a drop down list. Near enough is good enough. These ingredients are already deemed riskish free by the TGA. Sponsors “self certify” under GMP requirements. Basically claiming that the goods are produced under Good Marketing Practice. Finally they tick a box indicating that they hold good evidence. Hand on heart no doubt. No checks are ever run. They pay the $600 fee and receive an AUST L number. These goods are then able to be listed on the Australian Register of Therapeutic Goods. Between July 2009 and March 2010, the TGA completed 110 compliance reviews of Listed complementary medicines. Of these, 31 were random and 79 were targeted. 20 medicines had labelling issues such as non-compliance with labelling requirements and/or breaches which may mislead consumers. 12 included incomplete and/or inappropriate information on the ARTG. Label reviews were conducted on 52 medicines, of which 34 had compliance issues. Information included on the ARTG was reviewed for all 79 medicines, of which 54 had compliance issues. Manufacturing/quality/formulation reviews were conducted on 50 medicines, of which 30 had compliance issues. Evidence reviews were conducted on 15 medicines, of which 9 had claims that were not substantiated by the evidence submitted. Clearly then, the system can be abused and often is, highlighting the paper tiger status of the TGA, and the overburdened, under-resourced Complaints Resolution Panel. One issue that has been widely publicised followed a complaint by Dr. Ken Harvey about the SensaSlim weight loss spray. It’s now widely known that con man Peter Foster is indeed behind this global scam, with his name appearing on court documents. When Harvey’s complaint became known Ken was hit with a SLAPP – Strategic Lawsuit Against Public Prosecution. In this case SensaSlim sued for defamation. Under current guidelines all complaint processes must be halted until other lawsuits are finalised. This can take well over 12 months during which time profits continue to roll in. There’s very little in the review below that leads one to conclude such conduct is going to be more effectively dealt with. Whilst there are naturally occurring OTC products of known efficacy such as Omega 3 fish oil and St. John’s Wort, efforts must be made to seek sources such as Arthritis Australia or Beyond Blue to ascertain effectiveness. In both these cases not all arthritis nor all depression types respectively, respond to either product. A tragedy that has unfolded is the partnering of Arthritis Australia with daylight robbers, Ethical Nutrients. This rather unethical company will charge $70:00 and more for a small bottle of Omega 3 fish oil. It sits in splendid spotlit glory in a refrigerator in the pharmacy, even though it need not be refrigerated until after opening. Stalk a few shelves and you’ll find another brand for around $20 – 25:00. It’s important to realise the most common form of arthritic aches and pains is osteoarthritis. OA has not been demonstrated to benefit from Omega 3 beyond anti-inflammatory properties, and thence provision of some pain relief in some very few instances. Much is made of the reduction of enzymatic activity responsible for cartilage damage. Less is made of the fact this is not clinically significant. Rheumatoid arthritis, ankylosing spondylitis and psoriatic arthritis inflammation has been shown to respond. Omega 3, available from a number of foods and nuts has a beneficial effect on inflammation. But that hasn’t stopped Ethical Nutrients relentless advertising campaign adorned with the Arthritis Australia logo. If you’re thinking of using these products be sure you have ongoing inflammation or in the case of depression less than moderate. Be wary who you speak to in seeking advice, and please consult your doctor. Promoters of “alternative” income sources operate just as effectively by demoting sound medical treatment. Also, keep in mind none of these magical concoctions have ever been considered for PBS listing or are cheaper for concession card holders. Nonetheless, one may take some comfort from recommendation seven below. It directly addresses the absence of evidence loophole, also hinting at public education. Whilst many will hang doggedly onto entrenched habits, this recommendation and the paragraph on page 53 provide a valuable tool for skeptics and evidence based health advocates seeking to educate a largely science illiterate community. The TGA implement mechanisms to educate and inform the public that listed medicines are not evaluated for effectiveness by the TGA prior to market. The assessment by the TGA of complementary medicines (such as vitamin and mineral supplements, herbal medicines and especially homeopathic products) was raised as an important issue, in both the consultations and the submissions. Contributors were concerned that the recognition of these products by the TGA, and the AUST L number on the label, provided the public with a perception that the claims made for these products had validity. At both the consultative sessions and in submissions, it was asserted that many therapeutic claims, or claims regarding efficacy and safety made for complementary medicines, cannot be supported from the limited scientific evidence available, while information about possible adverse effects, especially their interaction with conventional medicines, is often lacking. However, complementary medicines are not permitted to state any interactions with conventional medicines in any material that could be considered advertising. It was accepted that the majority of complementary medicines are low-risk products, but low-risk does not mean no-risk. Submissions claimed that many complementary medicines are heavily promoted as ‘natural’ or ‘natural alternatives’, with the implication that they are harmless. It was said that this can result in consumers not advising their medical practitioner or pharmacist about their use, and that health practitioners often do not ask about them. Some submissions sought not just greater transparency on what an AUST L number means with respect to the TGA’s risk-based assessment of safety, quality and efficacy. They asked for changes in labelling and legislation. Some suggested that all labels, promotion and ARTG Public Summary documents of AUST L products should contain the warning, ‘These products have not been evaluated for efficacy by Australian health authorities’. Other submissions sought changes to the evidence-based requirements for listed medicines, to more clearly distinguish evidence-based complementary medicines from those that were not. Some submissions requested universal evaluation of all therapeutic goods for efficacy, arguing that there was no such thing as complementary medicines, only medicines with evidence of efficacy and those that lacked evidence. In particular, many submissions strongly put the view that the listing of homeopathic products by the TGA be ceased, as it is perceived to provide an unwarranted or inappropriate endorsement of the products that may be no better than a placebo. We last left SensaSlim on July 6th, after a look at some nasty tactics and the use of Rogers Digital marketing Australian news site, to publish “news” stories about their miraculous product. The cavalry is on the way. I have just been informed that SensaSlim International have arranged for two of the coordinators of the clinical trials that were conduct by the Institut De Recherche Intercontinental to travel to Australia to assist us in defending the integrity of the worldwide trials. The Institute are treating criticism of their trails very seriously. Dr Strebel who is currently in Moscow on a project and has made contact with SensaSlim lawyers to ensure they are given every assistance through the preparation of affidavits that can be presented to the Supreme Court of New South Wales with regard to the defamation proceedings brought against Dr Ken Harvey. They are also going to assist us with the preparation of any material that needs to be submitted to the ACCC to dispose of the allegations that the trials are not conclusive. We will also be proposing to have the trials coordinators speak with Today Tonight whilst they are in Australia and other health writers to combat this attack against us. I have now seen affidavits that have been filed in the courts in England by SensaSlim International against Dr Matthew Capehorn. There can be no doubt in anybody’s mind upon reading the material that Dr Capehorn was given the data he required to prepare the white paper and that he was prepared to continue to stand by the white paper conditional upon being paid additional money. As I have always said the dispute with Dr Capehorn has nothing to do with the evidence of the efficacy of SensaSlim but it is all about money. Area Managers have asked me to confirm that SensaSlim was approved to be sold as a dietary aid by the Therapeutic Good Administration based upon the ingredients and not the clinical trials. The clinical trial data was of no interest to the TGA and nor did they ask for it. All they wanted to be satisfied with was the ingredients in the product and the formulation and if based upon the science the product would be able to achieve weight loss. Those keeping up with the saga will recognise the arrogance in the wording of this newsletter on several points. Today Tonight have started to distance themselves from SensaSlim. It was beyond ambitious to suggest research authors from the Institut De Recherche Intercontinental (IRI) would – just like the cavalry – come a-recscuin’ by submitting materials, “to the ACCC to dispose of the allegations that the trials are not conclusive.” At much the same time the ACCC had discovered the IRI was a bogus entity and that photos depicting executives – or the cavalry, if you will – were also bogus, being photos of lung specialists from St Paul Lung Clinic in Minnesota, USA. SensaSlim legal eagle Terry Harrison said at the time, the Australian arm had cobbled the deal with Dennis Thornton of Lloyds Business Brokers, on behalf of SensaSlim Suisse Ltd. According to the director of Lloyds Business, Thornton was found dead last year. Australian Skeptics have an article here, reviewing the ACCC and Ken Harvey’s position. The ACCC had won a federal court order to freeze SensaSlim’s Australian assets, most likely on the basis of fabricated trial evidence presented on Australian TV. 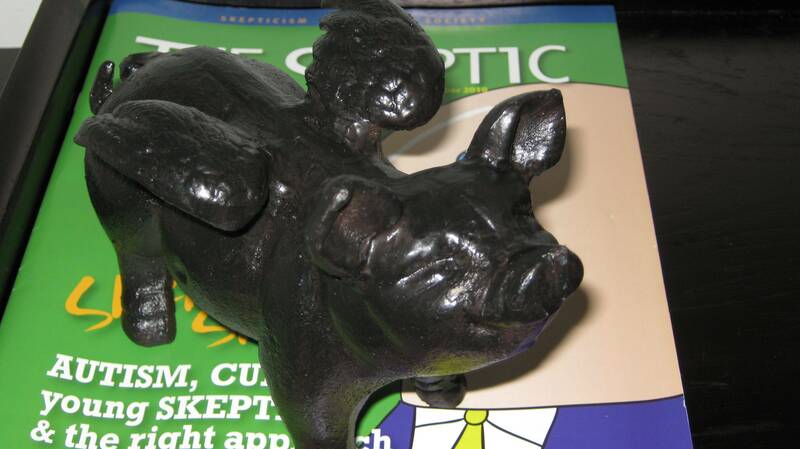 Certainly for engaging in ‘‘misleading and deceptive conduct’’ under the Trade Practices Act 1971. The assets are frozen until a hearing on August 31st. This is the basis of Dr. Ken Harvey’s complaint against the company. A report, not written by Harvey, about this complaint was published on auspharmacist.net.au provoking SensaSlim to sue for defamation. Making the caper even more overtly scam-worthy was the fact the same pictures of the USA doctors were published on the site of the Mountebank Clinic. The “clinic” address is an industrial estate in Bargo, NSW. Charming. The clinics’ director was passed off as an “Dr. Joseph Balsamo”, with an image of singer Alberto Balsamo and the qualifications of Flindsers University academic, Adjunct Associate Professor Mary Harris. The Mountebank gig is apparently part of Reef Health who open their website blurb with the strange line, “Reef Health Pty Limited is a 100% Australian company dedicated to natural products which are not only good for you, but actually help.” Reef Health is owned by Andrew Tarter/Tatar and his girlfriend Roxanne Naylor. That doesn’t stop Roxanne auctioning herself off for a date on this crass dating site – What’s Your Price? She’s getting good mileage from that profile picture. Tatar – or Tarter – is a struck off Sydney solicitor arrested in Vanuatu in 2007 under suspicion of helping smuggle a convicted conman from Fiji. That conman was none other than Peter Foster. Naylor and Tatar are respectively CEO and General Manager of Kava Kwik – Vanuatu Instant Kava. They own reefhealth.com which WAS reselling a product of sam grants (sic) in Australia. He did this in good faith and shipped all stock without payment.Andrew & Roxanne did not pay for ANY stock even though Sam shipped the orders. When Sam asked for his money Roxanne and Andrew went and registered domain names in Australia and the UK which are the brand name of Sam Grants product and redirected them to Reefhealth.com and posted a FALSE claim about the product. Roxanne then sent an email to Sam saying that she would be interested in selling the domain back to him. Extortion? 1. Roxanne and Andrew have history of scams and running scams. 2. Roxanne and Andrew did not pay for stock and pocketed the money rather than paying the bill. 3. Roxanne and Andrew then bought brand domains names and redirected them to their website which they changed and put a FALSE statment about the product to trick customers. 4. Roxanne and Andrew then began posting FALSE information on Sam Grant calling him a scammer. 5. Peter Foster is an international SCAMMER who is associated with Roxanne and Andrew. Interestingly enough he is in Jail at the moment so for him to post on an internet forum while is jail is truly amazing. Scammers scamming scammers? Or is it just a scam? Either way after this cosy chat and the information pulled together by The Age – and also independently by a member of Support Dr. Ken Harvey – it’s entirely possible Naylor and Tatar/Tarter were “fronting” for Foster. Reef Health accused The Age of “hacking” their Mountebank Clinic website and it disappeared on the same day. The Age has admitted using an incredibly complex and particularly darstardly piece of software known in hacking circles only as… “Google”. The next day, June 23rd saw reports of a $4.2 million class action by over 70 franchisees conned into paying up to $60,000 to buy SensaSlim stock. They also fell for the line of supposed clinical trials and substantial evidence. Slater & Gordon are working with the ACCC in a bid for compensation, which may indeed prove difficult given SensaSlim’s Australian accounts hold approximately $230,000. With regard to Dr. Ken Harvey’s defamation case, I mentioned last time that Justice Lucy McCallum had issued consent orders on June 14th. One of which was that, “The plaintiff file an amended statement of claim on or before 1st July 2011”. Sadly for SensaSlim this did not come to pass. 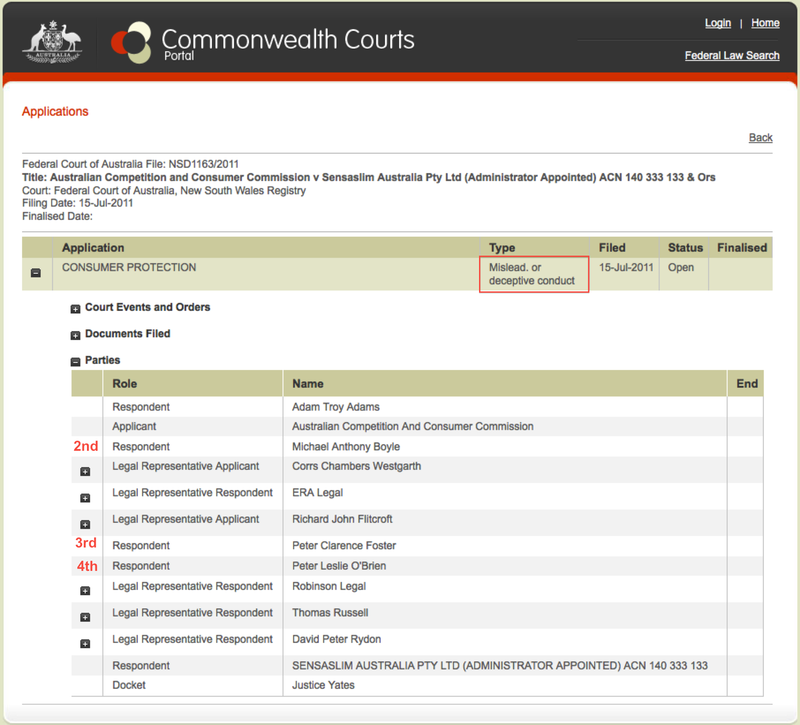 Following the ACCC action their lawyers, Kennedy’s Australia withdrew from the case. By June 30th John Kukulovski of Jirsch Sutherland was appointed administrator and by July 5th it was reported he was recommending liquidation. Dr. Harvey has been awarded costs although until happily reimbursed cause for celebration must wait. His lawyers will apply to have the defamation case struck off on July 11th. 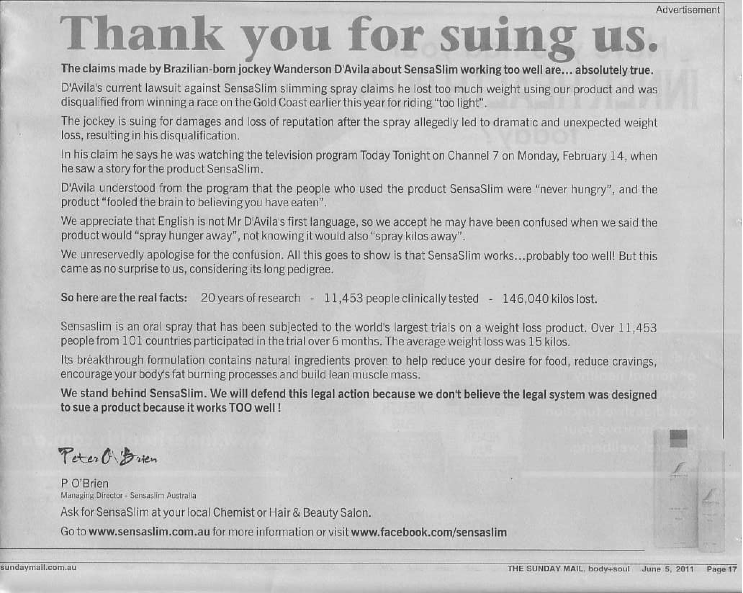 “TGA has already taken regulatory action through cancelling SensaSlim’s advertising approvals. We have tested their product and although we have found it does not contain any unsafe ingredients, TGA is continuing to assess other aspects of the product,” a spokesperson said. But on a newly established website the company confirms it’s proceeding against Harvey. Although the TGA assured Weekend Health in June that it had cancelled SensaSlim’s advertising approvals, the firm continues to promote its product on the new site, claiming the spray is approved by the TGA and the Health Department. A TGA spokesperson wasn’t able to clarify the situation as Weekend Health went to press. Harvey suggests the case highlights “fundamental flaws” in Australia’s system of regulation and promotion of complementary products. Specifically, the TGA’s lack of teeth and a distinction between “listed” and “registered” products that is unclear to the public. Listed products are assessed by the TGA only for safety and quality, while registered products are also tested for effectiveness. Being snobbed off is nothing new for the TGA. The article also mentions some nasty tactics recently used to bully co-complainant Dr. Lesley Campbell over her position in Harvey’s defamation case. Another problem of course is the role of pharmacists in selling the product – just one of many unproven remedies they stock. SensaSlim are also hyping up The Australian spray weightloss challenge, and use the site to boast the Australian Register of Therapeutic Goods certificate. The final balderdash to note is the “settlement” of the stunt case in which SensaSlim claimed the jockey of Black Caviar had lost too much weight. On examination it’s absurd. I opined to other’s on June 26th, when Yahoo 7 published the story that jockey’s are weighed pre and post race. Underweight jockey’s carry weights in their saddles. So Wanderson D’Avila was the correct weight and apparently magically lost 0.8kg within about 30-40 minutes before the next weigh in. Even The Age picked up this AAP story, in which D’Avila was apparently paid $12,500. Dr Capehorn noted recent press reports in Australia that highlighted not only eating disorders in the sport but lethal lifestyle choices associated with the need to lose weight quickly. He said the same pattern could be seen in the racing industry around the world. One can only anticipate the demise of this scam with something close to urgent glee. Nasty people, nasty tactics, nasty claims. Australia still lacks appropriate legislation to effectively and quickly deal with this type of nonsense. Though on the positive side, their assets are frozen, they went into liquidation on July 1st and Ken Harvey’s lawyers will apply to have the defamation case struck off on July 11th. Sadly, I’m sure SensaSlim will go on to rort consumers in Europe for some time to come. June was a bad month for miracle diet spray SensaSlim. To date I’ve only published The Sensaslim Affair by Ken Harvey, SensaSlim Jockeying for credibility, Beware the lure of new treatments – a very pragmatic piece by Professor John Dixon and Louisa Hall’s piece – which I’ll get to. We know that Dr. Ken Harvey is one of seven, perhaps nine, complainants and that Professor Lesley Campbell, from the St Vincent’s Hospital diabetes centre is another. As can be read in the above the complaint was simple in that SensaSlim was making ridiculous claims of efficacy. In the absence of any evidence – the much hyped “research” has still not been validated – the claims were most likely fabricated. The parties have liberty to relist the proceedings in the defamation list on 11 July 2011. Basically this meant Dr. Harvey had not had the charges thrown out. The plaintiff – SensaSlim – was to file an amended claim by July 1st. SensaSlim thus had to pay Dr. Harvey’s costs because of their amended statement of claim and there was another opportunity on July 11th for potentially seeing the case dismissed. On June 17th, Louisa Hall writing for Fairfax noted the appalling situation that had allowed this action to come about. Primarily that if any court action is underway complaints lodged with Australia’s TGA against the plaintiff can not be pursued through the Complaints Resolution Panel – CRP. This allows ongoing selling of, and profitting from, the product through it’s “outlandish” claims. Libel cases may take over a year leading to significant income for what may turn out to be a scam. This is a major flaw in TGA legislation. They will only invoke Section 30 of the Australian Therapeutic Goods Act, 1989, which would make ongoing selling and advertising illegal, when the company itself is deemed to be acting fraudulently. This would also remove SensaSlim from the Australian Register of Therapeutic Goods. But as noted here before, presently the TGA care not if a product works: only if it considered to be of acceptable risk. In the article by Louisa Hall SensaSlim’s legal adviser, Terry Harrison denied the entire defamation suit aimed to gag Dr. Harvey. Interestingly almost two weeks before, SensaSlim Newsletter number 42 was falling into the odd lap. Written by Adam T. Adams – Australian Manager, it contained reference to the CRP in stark dissonance to Terry Harrison’s assurances. “… determination published by the Therapeutic Goods Advertising code complaints resolution panel on the 30th March 2011, clearly found examples of inconsistencies of many representations, (our client are certain that the fact that this panel will now review SensaSlim’s responses to the complaint, which were only received by the panel on the 30th March 2011 and issue a new determination, which our clients are confident will not materially change nor effect the existing determination)”. “On Wednesday we received a phone call from a Area Manager, “DP”, saying that the Complaints Resolution Panel had brought down a decision and published it on their website in regard to a complaint about the SensaSlim website. We mentioned this to you previously that our competitors were filing complaints with a view to hindering our progress. So the lawyers for the above Area Managers said that they were ‘confident’ that a review by the Complaints Resolution Panel will not change anything. They, [names deleted] were ‘confident’ that the company would still be found to be at fault by the Complaints Resolution Panel. Is that ‘confidence’ built on anything except negativity or pessimism? I don’t think it is. But they were SO WRONG. So very very WRONG. So here’s the good news. Last week Peter O’Brien was at his desk until 11pm the night before the CRP were to reconsider the matter, and back at 5 a.m., drafting, redrafting and writing a 9 page submission. With the assistance of his legal team and SensaSlim in London’s lawyers a very comprehensive submission was written stating that the CRP had absolutely no justification at law in adjudicating on the matter since the company had filed an $800,000.00 defamation lawsuit against Dr. Ken Harvey. You see, it is written in Law that if the subject matter of the complaint is currently the subject of court proceedings, then the CRP are unable to adjudicate. I have attached a copy of the submission just so you get some understanding of the work, the very hard word that is happening behind the scenes that you never see, to uphold the good name of SensaSlim. So when I read that Area Managers think that the management of this company would be best served if we were replaced by them, and there were others at the helm I think it is absolutely laughable. Too silly for words, really! “TB” who suggests such an action and thinks he could run the company better, is the one who said that they were confident, the CRP would find against us. There are nine complaints that were received in a three day period two weeks ago. These were not complaints by members of the public, but clever legal crafted arguments by people acting on behalf of our competitors and big pharmaceutical companies. These are the same people who have written to the CHC to delay and hinder our progress and having our advertisements approved..and they also wrote to the TGA. But let me say this. We will not allow their dirty tactics defeat us. We had a very big win this week with the determination by the CRP that they cannot adjudicate on any matters pertaining to SensaSlim. It was known widely that the CRP decision was published, and then apparently removed within an hour or so. The reason given by the CRP was that SensaSlim claimed to have not been notified. That they never received email notification of the decision and thus did not file a defence. Yet above Adams is telling his own investors they did file a defence, the CHC got it wrong and Peter O’Brien “swung into action”. Confusing. We’ve also got a Big Pharma conspiracy and the lie that “competitors” are behind the “clever legal action”. Finally, there’s no ambiguity about legal action stifling complaints. But there was more fun to be had. Over much of the first three weeks of June I was corresponding with an editor from Australia.to, a sub domain of World News site http://www.international.to/, a service of RogersDIGITAL.com, which had been “reporting” frequently and favourably about SensaSlim. Rogers Digital specialise in providing advertising techniques including brand direct response and behavioural targetting. They “deliver a diverse audience for advertisers including… women and men of all ages, shoppers, travellers and business and IT professionals”. Their advertising opportunities aim to meet “all the needs of marketers”, via websites “which reach ‘buy-ready’ customers”. The jockey of super horse Black Caviar has admitted using the controversial slimming spray as his secret weapon allowing him to calm his nerves, forget about food cravings and focus on Black Caviar, but critics warn that this could lead to unexpected excess weight loss and potential disqualification. Correspondence dried up about the same time I spelled out the problems with SensaSlim’s “white paper”, and the fact Dr. Capehorn who was being used to endorse the product refuted that he made any comment supporting the jockey weight loss stunt. I also spelled out that Capehorn had quit his role with SensaSlim and issued statements through his lawyers. More so there were problems with Australia.to publishing even more articles claiming SensaSlim was represented at the 18th European Congress on Obesity in Turkey. I’ll get to that directly. I also asked Adam Adams to explain this claim of SensaSlim representatives attending the conference on the Support Dr. Ken Harvey Facebook Page on June 17th. By this stage most knew there was almost certainly no “evidence”, and it had become clear SensaSlim were not even at the Obesity conference. One complainant had attended the conference. Asked about the SensaSlim claims this person replied that none of the “so-called staffs said to have presented the work” could be found in the Congress abstracts. Secondly, no SensaSlim scientific presentation was witnessed. Thirdly, whilst there were outside booths at the conference at which weight loss products and devices may be advertised without any evidence, SensaSlim had manned none of them. What happens next – June 22nd onwards – is well known, but also very funny in respect of SensaSlim’s June 21st newsletter written by none other than the elusive Peter O’Brien himself. Given time differences it would seem that the ACCC were moving to freeze SensaSlim Australian accounts at much the same time O’Brien opened his newsletter with “Hello Everyone, The cavalry is on the way.” I’ll cover these events next with a look at the ridiculous “settlement” for the Black Caviar jockey stunt. For now a review of the ACA programme that pulls together the vital flaws in this blatant scam.